Earth's gravity is pulling down with a force of 1G which means one gravity . This is very specific to Earth and the Moon has 1/6 of gravity of earth. 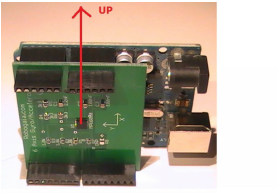 The accelerometer sensors usually output an analog , PWM or digital signal. Usually the maximum output is proportional to the VCC voltage. In order to calibrate the accelerometer we have to know the output of the accelerometer for the axes that is perpendicular to the Earth surface. So for example for x axes the axes has to point up. The Earth acts on one of the chip's axes with a force of one G . By Taking note of the output value we determined the value at 1 G.
If we would know the output value when the sensor output. The chip outputs a 16 bit signed value that is from -32768 to 32767. For accelerometers means from - 4G to +4G and for 1 G it will be 8191 counts. In the code example the accelerometers are setup to output up to +/- 4 g.
the values in international units.